URGENT ACTION NEEDED! URGENT ACTION NEEDED! URGENT ACTION NEEDED! On September 2 at Six o'clock in the morning, nine Immigration Bureau officials and about 30 police personnel came in Songseng Industrial Zone in Masok district. They stormed in the two Bangladesh migrants' house and arrested all 13 Bangladeshi migrants residents. They were hounded to the Namyang-ju Police Station and were violently pushed and thrown to the bus wearing only their sleeping clothes and many are not wearing any slippers or shoes at all. They were lined up for questioning and asked if they joined the rally opposing the massive crackdown and Korean Governments migrants policy. Kobir and Biddut were beaten up and handcuffed. The Police are looking for who have lead and joined the sit-in struggle in protest to the Korean Government's cruel policy. Kabir and Biddut were brought and detained in the Immigration Office. Later the police returned to the Masok Area and intimidated the other migrants in the area. Kobir and Bidduth are two of the leaders of the migrants community and members of the Equality Trade Union-Migrants Branch who have been in the sit-in struggle inside the Myongdong cathedral from April 28 to the middle of July. They are part of the migrants movement help spark flame and vanguard of the of the migrants movement in Korea . The Immigration and Korean Government aims to stop and suppress the upsurge of the strong migrants protest movement that's why they targeted Bidduth and Kobir in the first wave in the series of arrest. As of today, Kobir and Biddut are detained in Hwasu Detention House in Suwon, 2 hours form the outskirts of Seoul. Their arrest become the signal fire which will be followed by the extensive and intensive crackdown against 260,000 migrant workers all over Korea. On August 29, Immigration Bureau arrested and detained 14 migrant workers from Ansan City. Those arrested are the unregistered migrant workers, registered workers, trainees and even those who are suffering from industrial accidents. Migrant workers became the target of crackdown only because they are migrant workers. The 3 migrant workers are released owing to the protest of Korean migrant supporting group members. However, Immigration Bureau will deport other 11 migrant workers. Now the Korean government had began the intensive and extensive crackdown on migrant workers and treating them as criminals. They will try to catch and deport migrant workers as many as possible. It is a war against migrant workers. But We migrant workers are not criminals but heroes of a production. We are not beasts but human beings. But the government and bosses treated us otherwise. Our suffering ranges from being overworked and underpaid, from lack of medical insurance to industrial accidents, from verbal abuse to physical and sexual violence. And now a violent attacks is being launched to arrest and deporting us. ETU-MB (Equality Trade Union Migrants' Branch) and many solidarity groups (Trade unions, militant students, labor movement organizations, Human rights groups, etc.) are protesting the government everyday. Migrant workers are going to hold a rally on September 8 in front of the United Government Building. The government may attack the rally. The followings are our demands. Following our demands to the Korean government. 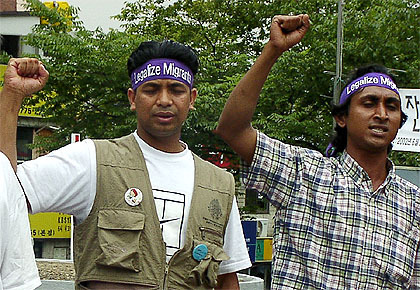 (6) Recognize the rights of migrant workers in South Korea. (7) Sign the UN Convention for the Protection of Migrant workers and their Families. Abroad, we are trying to seek your support to join us in protest to exert more pressures. Attached is the copy of the Struggle Declaration in support for our demands. 1. We request you/your organizations to send a reply to this e-mail to include your name as one of the signatories to the declaration. And please re-forward it to as many organizations and individuals as possible. 2. May we also strongly request you to participate in the Internationally Coordinated protest action to be held in front of Korean Embassies/Consulates in your country. We are suggesting you to join us on the simultaneous starting this week. 3. Signing and Forwarding the letter petition to be sent to the offices of the Ambassadors at the different Embassies of Migrants in South Korea or to the Ministry of Foreign Affairs and Trade: Fax: (82-2)-739-5370. Attached below is the copy of the Petition letter to the Korean government and addresses of Embassies. Please read the petition letter and we encourage you/your organization to co-sign the petition by replying to this e-mail. The petition letter together with your organization/individual name will be sent to Mr. Kim Dae Jung, President of the Republic of Korea and to Mr. Mr. Choi Kyung-won of the Justice Ministry. Looking forward for your support and Long Live International Solidarity!! !